Get snap happy with one of Santa’s cheeky helpers in Selfie Elfie. Created by Playtech, it’s a 5 reel, 40 payline video slot that comes with respins and free spins with wild extras hitting in both. Play this entertaining festive-themed title on all devices from between 10p and £500 per spin. Playtech has created a cracking looking game here. Set against a wall filled with pictures and Christmas decorations, the green reels are set within a picture frame. There’s you’ll fine A to J playing cards and a collection of selfie-style photos of Christmas-themed characters. In order of value are a gingerbread man, female and male elves, a reindeer and Santa’s wife. The best of the standard symbols is Santa himself who’ll get you 10 times your bet if you land 5 on a payline. Sporting shades and a goatee, Elfie the Elf is the wild. He replaces all the standard symbols. Land 3, 4 or 5 of these in combination and you’ll pocket an award of 2, 5 or 12.5 times your total bet. Wilds are central to the action in both of the game’s bonus features. Selfie Elfie Respins feature – this can trigger at random on any base game spin. The carousel above the reels will whirr into life. The Elf will take a selfie with 1 of the higher value character symbols. That symbol will then be wild (alongside the standard Elfie wild) for the respin that follows. This continues until the wild appears under the arrow. 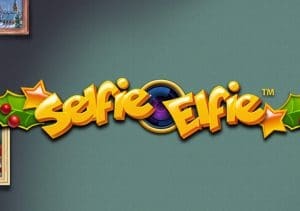 Selfie Elfie Free Games feature – you’ll be awarded 8 free spins if you land the Selfie Elfie scatter on reels 1, 3 and 5 on the same spin. On each of them, the carousel will be in play. It will stop on each free spin to snap a selfie and turn a symbol wild. Each time a new symbol gets the selfie treatment, it becomes wild for any free spins you have left. If the carousel stops on the +3, you’ll see an extra 3 free spins added to your tally. The best winning potential comes via the Selfie Elfie Free Games feature – by the end of your free spins, you could see multiple wilds spinning around the reels which can lead to some spectacular action. Up to 500 times your total bet on every free spin. Playtech has created an entertaining Christmas video slot here. The design is good but doesn’t overload the schmaltz and the extra wilds can deliver some real festive cheer. Christmas video slots are a bit of an acquired taste but Selfie Elfie is one of the better offerings – I also recommend ELK Studios’ Taco Brothers Saving Christmas which is just excellent.